It’s been a while since I posted a recipe I like from out in cyberspace. I decided to find a recipe using zucchini boats. This recipe is a great example of using healthy food as a foundation for flavor. Too often, heavy carbs are used to support a dish – pasta, breads, etc. This adds unncessary calories and all the carb heavy diet drawbacks. Using zucchini or squash or other bulky vegetables as the foundation you get the bulk you need to feel full without losing any of the flavor. Enjoy! Preheat oven to 400° degrees F. Cut zucchini in half lengthwise; scoop out pulp and seeds, leaving 1/4-inch shell (use a small spoon for this). Reserve pulp from two zucchini and chop. Combine zucchini pulp, garlic, tomato, mushrooms, basil, oregano, crushed red pepper flakes, olive oil and 1/2 cup cheese in a medium bowl. Divide mixture among zucchini shells.Place stuffed zucchini in a 13 x 9 baking dish; cover with foil. 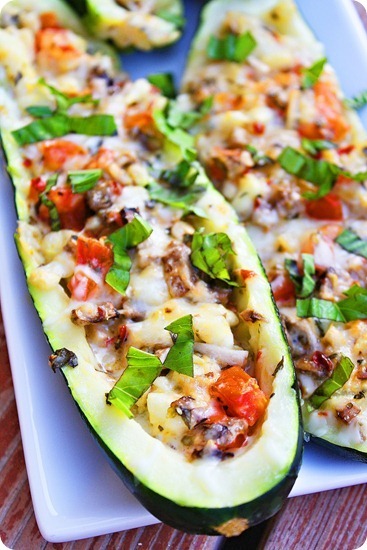 Bake for 25 minutes or until zucchini is tender. Sprinkle with remaining cheese. Bake uncovered 5 minutes more or until cheese is melted. Top with fresh basil.